OaSIS is going to provide valuable results to individual entrepreneurs as it is described in the section Are you an innovative SME?. During a presentation to startups and young entrepreneurs from Friuli-Venezia-Giulia it has been analysed how they could use OaSIS to get a complete report profiling enterprises. With the tools developed by OaSIS projects, the young entreprenuers will have the possibility to compare their startups with similar companies. The OaSIS project will provide a software facility to entrepreneurs that would profile their enterprise, comparing it with similar players and suggestions for funding (grants, loans, investments). It will allow entrepreneurs to focus on what really works. An analysis of the recipe of those companies who made it to sustainability and achieved incredible growth, so that the entrepreneur can learn from their real paths of other companies. This action is part of the promotion of enterprise culture and advanced management in enterprises. The entrepreneurs are seeing closely how decisions are taken in the European context. With the OaSIS project they have discover the possibilities offered by development agencies. The overall output of this action will be the development of young entrepreneurial ideas of the territory, with international contacts as a result of a visit to this important European space for startup businesses. The meeting has been organised in the framework of the ActionEU project for Young Entrepreneurs. Those entrepreneurs have been hosted by the representation to the EU of the autonomous region of Friuli Venezia Giulia. 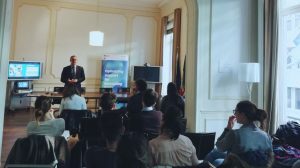 During a two-day visit to Brussels, they had made a pitch session of five companies that was managed by Mr Bogdan Ceobanu, an expert working for the Startup Europe Initiative of European Commission. During the second day, the entrepreneurs participated in a practical workshop with the participation of the OaSIS project and the European Crowdfunding Network.